This chocolate praline crunch cake is a sponsored conversation written by me on behalf of Pillsbury™. The opinions and text are all mine. I used to think that decorating cakes was my thing. I even took a cake decorating class at our local cake supply store a few years ago with my mom and sister. I had dreams of making the most beautiful cakes ever. That was until Pinterest became a thing. Since then, I’ve allowed those sugary dreams to take a backseat to my more realistic dreams of food blogging and photography, but I still appreciate a beautifully decorated cake. The thing is, I don’t actually enjoy the process of creating those awe-inspiring cakes, and I’m not able to torture myself into loving it, especially now that I have a toddler, and a house to renovate, and business to run. I mean, I can barely keep my bathrooms clean. So, when I saw the NEW! Pillsbury™ Filled Pastry Bags in the baking aisle at Meijer, I knew it would be an amazing thing. I mean, I could still create my own cake and make it pretty, without all the messy cleanup and prep. The Pastry Bags come in three delicious flavors: Vanilla, Chocolate Fudge, and Cream Cheese. The best part was that the chocolate fudge flavor was dairy free. I knew I had to get one – or two – and I knew exactly what I would use it for. I had been dying to make a chocolate praline crunch cake. 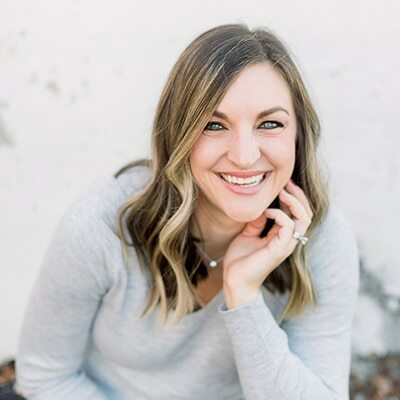 It’s been on my list ever since Ashleigh and I dreamt up the idea of doing our Friday Night Dinner series, but it’s always seemed a bit overwhelming to me. Ever since my cake decorating days, I basically avoid baking whole cakes unless I absolutely have to. Birthdays are basically the only time I’ll allow it. Luckily, it was my birthday last week, which I share with my twin sister, and my dad’s birthday is tomorrow. The day after I got back from Minneapolis, I spent a day in the kitchen baking this lovely cake, and I’m so happy I did. This cake is phenomenal. 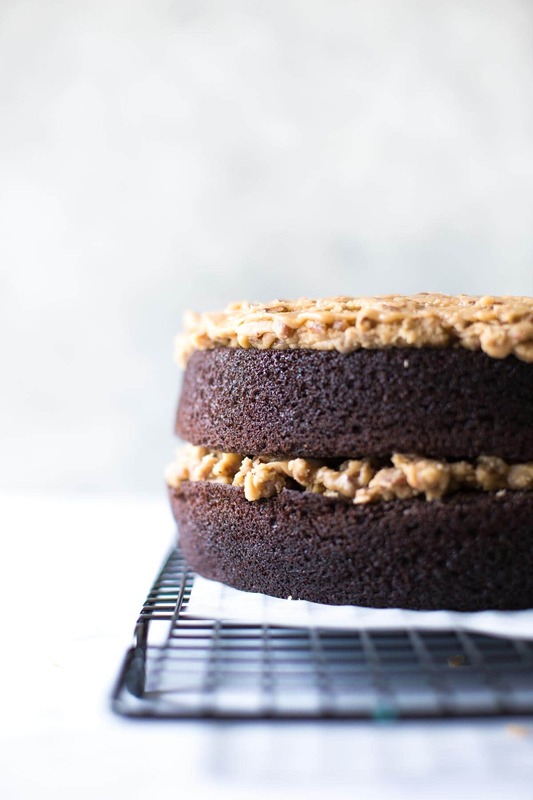 It’s similar to a German chocolate cake, without the coconut. So it’s perfect for all you coconut haters out there. I won’t go so far as to say it’s an easy cake to make. Mostly because there’s more steps than usual involved, but using the Pastry Bag made it so much easier than it could have been. 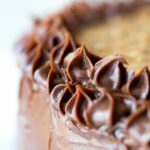 I used a basic chocolate cake recipe that I made dairy-free by swapping almond milk for milk, and the recipe normally uses vegetable oil, so I was in the clear there. 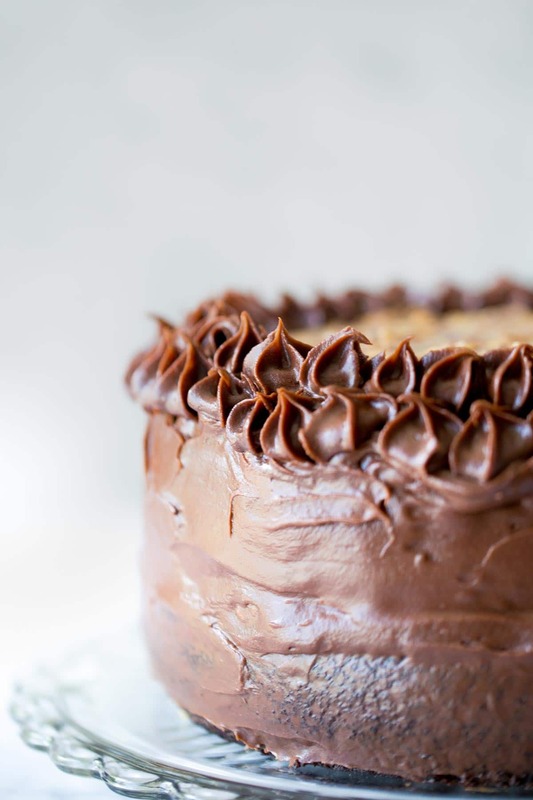 If you want to hack this recipe by using a boxed chocolate cake mix, do it. 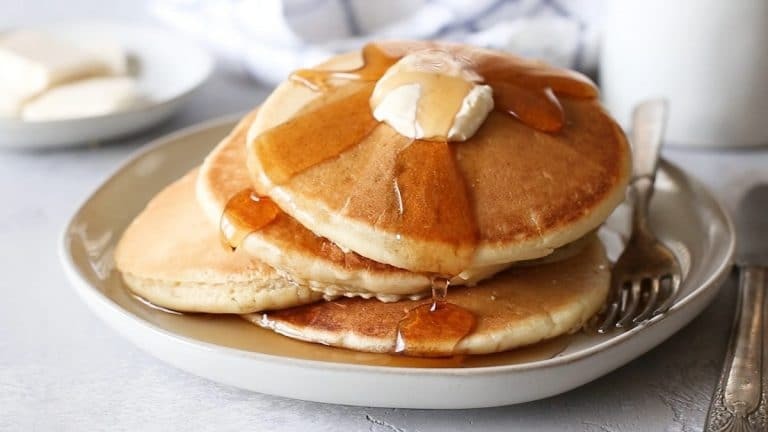 I know there are several out there that don’t include dairy, just read the ingredients on your labels and follow the directions for making two 8 or 9-inch layers. The praline filling required the most adaptation, but I swapped coconut oil for butter and vanilla almond coffee creamer for the heavy cream, which allowed me to omit the vanilla extract. Once the layers were all assembled, I used one piping bag to frost the sides of the cake, smoothing it out as I went with a spatula, and then I piped two rows of pretty stars around the edge on the top. The Pastry Bag comes with a built-in star tip so you can easily decorate in three fun designs: stars, rosettes, and waves. To use the Pastry Bag, simply push the frosting toward the star trip and twist the top of the bag. If not removed, remove the plastic cover from the star tip by tearing at the perforation. Then, squeeze from the top and frost! I’m no professional cake decorator by any means, but I’m actually really happy with the way mine turned out. 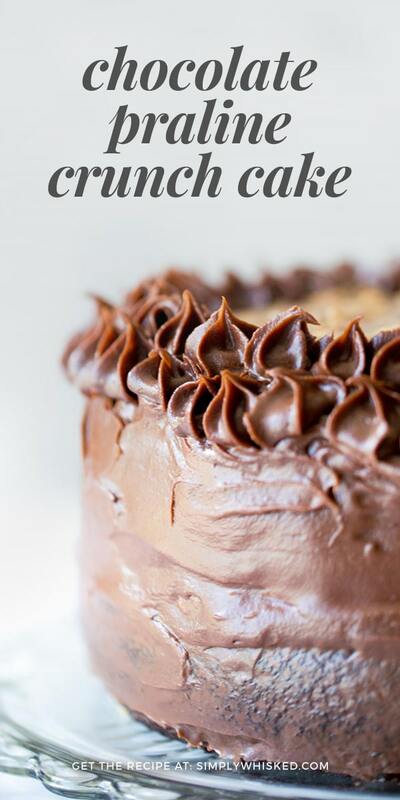 What is your favorite way to frost a cake without going totally crazy? Try using one of these pastry bags next time to make things easier. 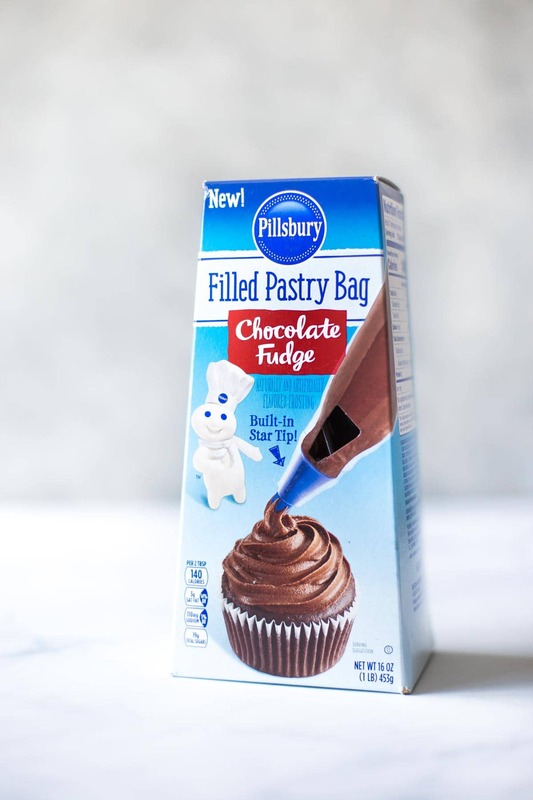 Plus, you can save $1 on any Pillsbury Filled Pastry Bag with this mPerks digital coupon. Preheat oven to 350˚F and grease and flour two 9-inch layer pans. In a large bowl, whisk together dry ingredients. Add eggs, almond milk, oil, and vanilla extract, beating with an electric mixer (or whisk) until smooth. Slowly pour in boiling water, stir or whisk until smooth. Divide batter between cake pans and bake for 30 – 35 minutes, or until an inserted toothpick comes out clean. In a large saucepan, heat sugar, coffee creamer and coconut oil on medium-high heat until melted. Whisk until smooth. Reduce heat to low, and stir in powdered sugar and pecan pieces. Simmer until ready to use. Remove praline filling from heat 5 minutes prior to assembling cake to keep it easy to spread. Place bottom cake layer on serving tray. Spread a layer of praline on bottom layer. Add next layer of cake followed by more praline. 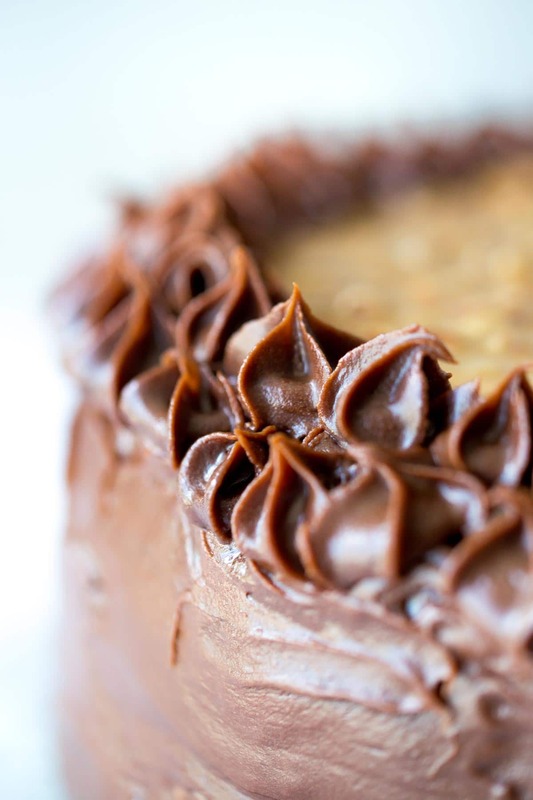 Allow cake to cool completely before frosting. 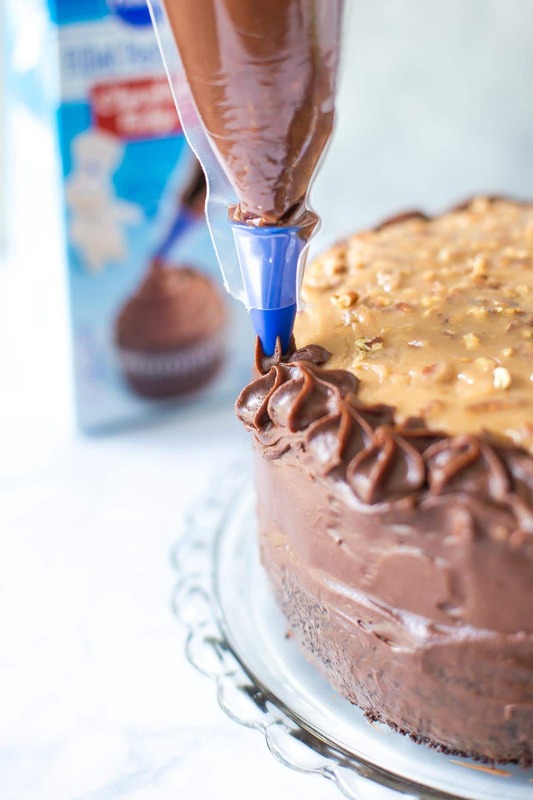 Frosting sides of cake using Pillsbury Filled Pastry Bag Chocolate Fudge Frosting, smoothing with a spatula as needed. 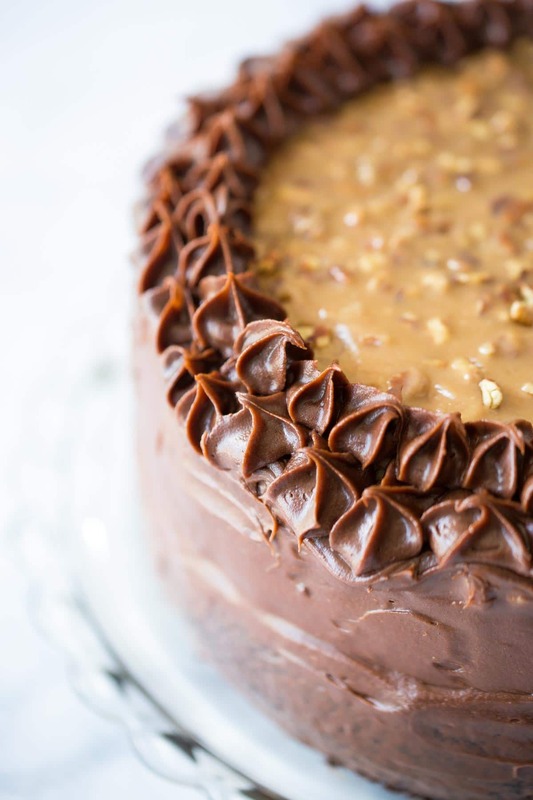 Finish cake by piping a border of stars around the top edges of the praline. Vanilla Almond Coffee Creamer? Giiiiirrrrlllll…. You could easily use canned coconut milk + a splash of vanilla extract if you want!